Life is a Dream come true when you’re at the Cottage. Lazy days of summer are a treat when you spend them at the cottage. Huddled & gathered around the table enjoying dad’s latest BBQ treat paired with mom’s homemade potato salad. The vision for the 2018 Big Brothers Big Sisters Dream Cottage was inspired by riverside memories of years gone by. Touches of coastal blue paired with an updated “on trend” deep blue give you the feeling of fresh and dreams of waterside views. Tip #1- Themes are for parks, great style is for the cottage. Pick you Style and stick to it! Often times folks tend to come up with a “theme” or look for their space and take it one step too far. I never like to use the word theme to describe a home or cottage. It tends to make you think in a narrow scope instead of broadening your horizons or definitions of the look you are on the hunt to create. Stay focused, stay on track and keep your designer shopping list on hand at all times. We know not to shop for groceries hungry and without a list. The same for design shopping, don’t shop without a carefully planned design and your list. Tip #2- Nautical, Coastal and Cottage isn’t all about anchors & lobster traps. It’s about creating a feeling of being on the coast, water’s edge or the perfect summer retreat. Without realizing it, patterns, textures and certain colours awake the coastal feel in all of us. When planning this year’s cottage, the team at Décor Haute Look pulled together comfortable fabrics in patterns of gingham & plaid with hints of whimsical fresh florals throughout. Added to the look are accents in multiple colours of blue for a feeling of comfort and waterside style. 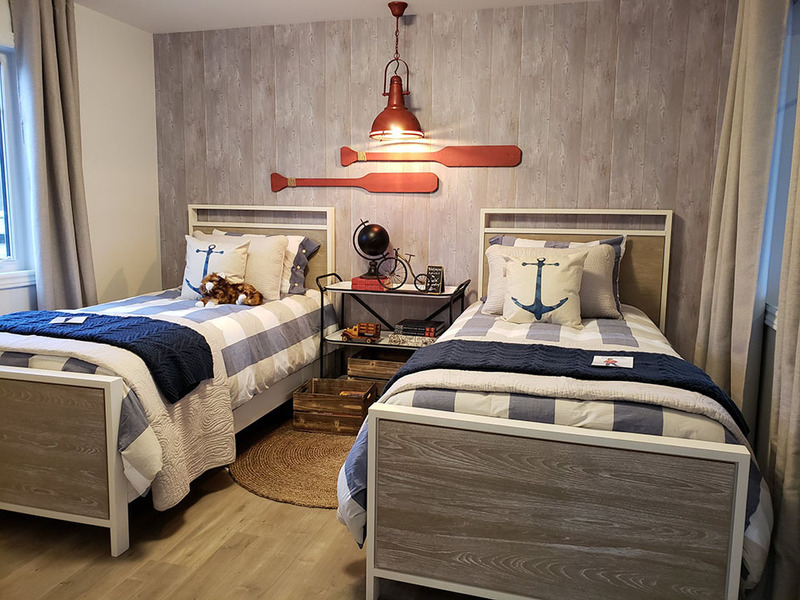 Notice how the bedding paired with the wallpaper awakens a sense of comfort when paired with the pop of colour created by the red oars affixed to the wall for art. Tip #3- Sometimes the Odd piece is the perfect piece. Like grandma used to say, “Too much of a good thing is Not a good thing”. Like our wardrobes, wearing too much of the same designer can be bad for the complete look. In design, too many “matching” pieces can be a bad thing. In particular, when you are trying to create a cottage look, stay away from the “5 piece set” in the kitchen and the bedrooms. This year’s Dream Cottage is layered in odd pieces to create the perfect designer look. In the bedrooms, night stands nicely compliment the beds, but are not from the same collection. The dining area is a mismatch of white Amish-style dining chairs paired with a more refined style dining table. The mismatched look has a place in this cottage, it actually completes it. We hope you enjoy and are inspired by the design Julie, Johanne and I have put together for this year’s Dream Cottage. Roy Brothers construction has once again patiently, professionally and perfectly executed and built an amazing cottage for us to design. Thank you to them and to you folks for supporting this worthy cause. After all, summer is about lazy, enjoyable days and new memories – the monetary proceeds from this cottage grants those same feelings to the kids in which they support. Here’s to wishing you that your dreams come true at the cottage this summer. 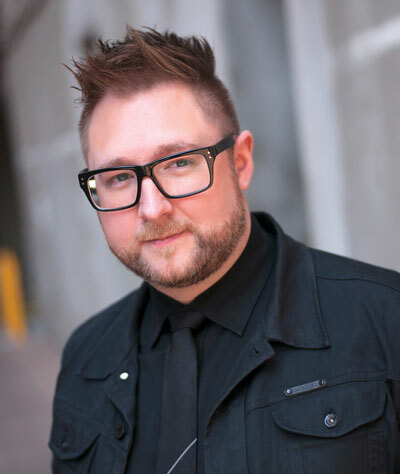 Jamie Alexander is an award-winning designer, home decor writer and TV personality that has been named one of the "Top 10 designers in Canada”. He can be found from time to time working in the design studio with Julie & Joanne at Décor Haute Look in the scenic town of Neguac.